If you live in Tucson, you probably don’t see snow very often. However, if you’re going out of town on vacation or for work, you’re going to want to be prepared for the worst weather conditions, especially if you’re headed to a more northern state. Or, if you’re sitting in Tucson and there’s a rare occurrence of snow, you’ll want to be prepared so you don’t have to skip work and sit at home twiddling your thumbs. To people in the south, snow driving can be somewhat of a mystery, but I’m here to break (pun intended!) through this wall and provide some helpful tips for being prepared next time you find yourself in a blizzard. If you haven’t driven in snow before, the first thing you’ll probably do when you look out the window is panic. It’s okay to not like snow, but there’s no reason to be afraid of it unless there are extreme blizzard conditions. If you’re not sure if the conditions are safe to drive in, turn on the news or contact a friend. Otherwise, if you see people driving around and your car isn’t completely snowed in, you should be fine. However, you should always be aware that there could be ice under the snow. If you hear on the news the night before that there will be snow, you’ll want to be prepared the next day. Wake up at least 30 minutes before usual to make sure you have time to wipe off your car. If your car is covered in ice that won’t come off with a scraper, you’ll want to get some luke-warm water, pour it on the ice, then quickly scrape it off and wipe the remaining water off with a towel. It’s important that the water isn’t too hot or cold because the ice may not melt, or if it’s too hot, the rapid change of temperature could crack your window. Here it is, the hard part! It doesn’t have to be that way if you’re careful though.The key to driving in the snow is not driving too fast and most importantly, don’t make any sudden adjustments to the gas or brakes. Everything you do should be gradual, so that means not driving too close to other people. If you feel like you are about to slide, gradually pump your brakes until you come to a complete stop. 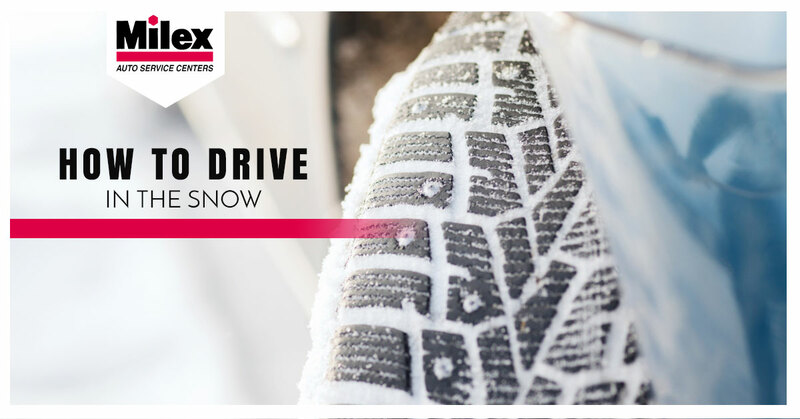 With these tips, you should be well on your way to driving in the snow, like a pro! If you’re in need of car repairs in Tucson, visit our auto mechanics at Milex Auto Service!